The Indian Museum in Kolkata, also referred to as the Imperial Museum at Calcutta in British India era texts, is the largest and oldest museum in India and has rare collections of antiques, armour and ornaments, fossils, skeletons, mummies and Mughal paintings. It was founded by the Asiatic Society of Bengal in Kolkata (Calcutta), India, in 1814 C.E. The founder curator was Nathaniel Wallich, a Danish botanist. It has six sections comprising thirty five galleries of cultural and scientific artifacts namely Art, Archaeology, Anthropology, Geology, Zoology and Economic Botany. Many rare and unique specimens, both Indian and trans-Indian, relating to humanities and natural sciences, are preserved and displayed in the galleries of these sections. the administrative control of the Cultural sections, viz. Art, Archaeology and Anthropology rests with the Board of Trustees under its Directorate, and that of the three other science sections is with the geological survey of India, the zoological survey of India and the Botanical survey of India. The museum Directorate has eight co-ordinating service units: Education, Preservation, publication, presentation, photography, medical, modelling and library. This multipurpose Institution with multidisciplinary activities is being included as an Institute of national importance in the seventh schedule of the Constitution of India. It is one of oldest museums in the world. This is an autonomous organization under Ministry of Culture, Government of India. The present Director of the Indian Museum is Rajesh Purohit.The museum was closed to visitors due to massive restoration and upgrades from 1 September 2013 to 3 February 2014. The Indian Museum originated from the Asiatic Society of Bengal which was created by Sir William Jones in 1784. The concept of having a museum arose in 1796 from members of the Asiatic Society as a place where man-made and natural objects could be collected, cared for and displayed. The objective began to look achievable in 1808 when the Society was offered suitable accommodation by the Government of India in the Chowringhee-Park Street area. In February 2, 1814, Nathaniel Wallich, a Danish botanist, who had been captured in the siege of Serampore but later released, wrote a letter supporting the formation of a museum in Calcutta which he said should have two sections - an archaeological, ethnological and technical section and a geological and zoological one. The Museum was created, with Wallich named the Honorary Curator and then Superintendent of the Oriental Museum of the Asiatic Society. Wallich also donated a number of botanical specimens to the museum from his personal collection. After the resignation of Wallich, curators were paid salaries ranging from Rs 50 to Rs 200 a month. Until 1836 this salary was paid by the Asiatic Society but in that year its bankers, Palmer and Company became insolvent and the Government began to pay from its public funds. A temporary grant of Rs 200 per month was sanctioned for maintenance of the museum and library, and J. T. Pearson of the Bengal Medical Service was appointed curator followed shortly by John McClelland and after his resignation by Edward Blyth. In 1840, the Government took a keen interest in the geology and mineral resources and this led to an additional grant of Rs 250 per month for the geological section alone. A new building became a need and this was designed by Walter R Granville and completed in 1875 for the cost of Rs 1,40,000. In 1879 it received a portion of the collection from the India Museum (South Kensington) when that collection was dispersed. The Zoological and Anthropological sections of the museum gave rise to the Zoological Survey of India in 1916, which in turn gave rise to the Anthropological Survey of India in 1945. Egyptian human mummy, about 4,000 yrs old, at Indian Museum. It currently occupies a resplendent mansion, and exhibits among others: an Egyptian mummy. The mummy is being restored. 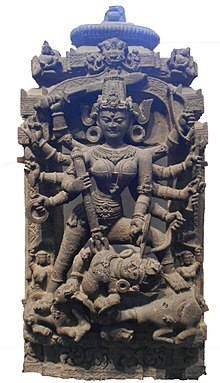 Indian artifacts include the Buddhist stupa from Bharhut, the Buddha's ashes, the Ashoka pillar, whose four-lion symbol became the official emblem of the Republic of India, fossil skeletons of prehistoric animals, an art collection, rare antiques, and a collection of meteorites. The Indian Museum is also regarded as "the beginning of a significant epoch initiating the socio-cultural and scientific achievements of the country. It is otherwise considered as the beginning of the modernity and the end of medieval era" by UZER Places. The museum has four galleries dedicated to natural history, namely the botanical, insect, mammal and bird galleries. ^ "Indian Participants - National Council of Science Museums." Ncsm.gov.in/TenderDoc/Announcement%20Brochure%20India.pdf. N.p., n.d. Web. ^ "::: Indian Museum :::." ::: Indian Museum :::. N.p., n.d. Web. 8 December 2013. ^ "History of Indian Museum". Website of the Indian Museum. Ministry of Culture, Government of India. 2012. Retrieved 20 January 2013. ^ "History of Indian Museum (second page)". Website of the Indian Museum. Ministry of Culture, Government of India. 2012. Retrieved 20 January 2013. ^ "Appendix K: The Anthropological Survey of India (The Andamanese by George Weber)". 10 September 2005. Archived from the original on 25 May 2006. ^ Smith MA (1931). The Fauna of British India, Including Ceylon and Burma. Reptilia and Amphibia. Vol. I.— Loricata, Testudines. London: Secretary of State for India in Council. (Taylor and Francis, printers). xxviii + 185 pp. + Plates I-II. ("Anderson, Dr. John, F.R.S., 1833–1900", p. 10). ^ Britannica encyclopedia. Tata Mcgraw Hill. March 2002. ^ Mitter, Sohini. "4,000-year-old Egyptian mummy to get a face-lift". Mashable. Retrieved 21 October 2018. ^ "Wrapped for another day... or millennium". @businessline. Retrieved 21 October 2018. ^ "Egypt Wants To Help Restore Indian Museum's 4,000-Year-Old Mummy-In-Residence". HuffPost India. 7 April 2017. Retrieved 21 October 2018. ^ "Indian Museum | UZER". myuzer.xyz. Retrieved 20 October 2016. Wikimedia Commons has media related to Indian Museum, Kolkata.